What to do, and not do, if your child is being bullied. As you might imagine, the topic of bullying comes up a lot in our social skills classes. It is an unfortunate fact that kids who struggle socially are much more likely to be targeted by bullies than their socially adept peers. However, given the right set of circumstances anyone can become a victim of bullying. No parent wants their child to be bullied. And most will do their best to protect their child. However, it is very easy to make the problem worse. A very common mistake is talking to the bully’s parents. It is easy to understand why so many parents make this mistake. It seems perfectly logical to talk to the other parent. Surely they would want to know that their child is being a bully, right? Wrong. Put the shoe on the other foot, how would you like to get that call? While we all know that we should want to know if our kid was being a bully, there is a big difference between saying that and living it. With that in mind, here are 3 of the most important reasons you should not talk to a bully’s parents. 3 important reasons why you should not talk to a bully’s parents. They will deny that their child is a bully. Many people live in the great state of denial. When they do, there is nothing you can do to convince them that their little darling could ever do such a thing. Many parents are bullies. They gossip. They are disrespectful to other people such as waiters, hired help, or their spouses. When dealing with this sort of person, there is a very good chance that they will shift the blame to you and your child. Your child will get branded a tattletale. No matter what type of parent you are dealing with, there is a very high risk of them causing your child to be branded a tattletale. When this happens it greatly increases the odds of more abuse. While the bully may become sneakier about it, the odds of the bully stopping are very low. It is much more likely that the bully will seek revenge. The older the child, the more likely that this will happen. Do these 4 things, instead of calling the bully’s parents. Determine if your child is actually being bullied. Just because your child feels like he is being bullied, does not make it so. Bullying is not a onetime event. Bullying is any repeated behavior that is meant to maintain an imbalance of power. It could be physical, verbal, and/or relational. It is important to remember that bullying is about power. It is not a fight, disagreement, or good natured teasing between friends. Bullying is meant to help the bully establish, and maintain, power over the victim. Find out how long the bullying has been going on. Kids often don’t tell anyone when they are being bullied. They don’t want to be seen as tattletales. That can make the problem worse since the longer it goes on, the more difficult it will be to stop. That is because patterns of behavior tend to ingrain, and other kids tend to start joining in. Even good kids will join in bullying. They do this because of peer pressure, and because they fear becoming the victim. So, they side with the bully. Consider the context. Is there a specific time and place that the bullying is happening? Once you know the context, then you have the potential to change the context. For example, if it is happening on the bus, you may be able to get your child moved to a new seat on the bus. If it is in class, you may be able to get your child moved to a different seat in class. This can be especially effective with pre-tween kids, and if you catch the bullying when it first starts happening. Consider the role your child is playing. It is very important to consider the things your child may be doing to cause the bully to target him/her. While your child may not be doing anything, s/he could be. And even if it is something unintentional, if your child is doing something that makes him a target, then changing that behavior is the best way to stop the bullying. That’s not blaming the victim. It is not excusing bullying. It is empowering you and your child. While it is very unlikely that you can stop a bully from being a bully, you can help your child to not be a target. So talk with your child about the situation. Find out what the bully is saying and/or doing. Is there a common theme? Is the bully picking on something that could be changed such as the style of clothing? 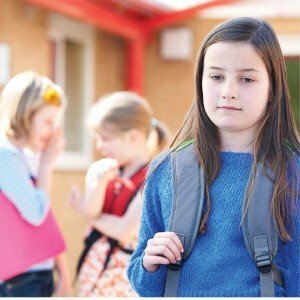 Is the bully targeting your child because s/he freaks out and makes a scene? Knowing what the bully is targeting can help you change the situation. That is not to imply that this is a quick fix. Bullying is a complicated social problem, and it is very easy to make it worse. That is why it is important for you to minimize your emotions and think strategically about the problem. Don’t go off half-cocked. You must think through the potential outcomes and weigh the costs of different actions. And it is very important to keep in mind the things you can control, and the things you cannot control. Helping your child develop the social skills to avoid being a target is something that you can control. Unfortunately, this will not be the last bully your child will encounter. Anywhere there is a social group, there is the potential to encounter a bully. So not only will your actions impact the situation now, they will also impact how your child deals with bullies in the future. About the author: Jason Marrs is the Director of Research and Awareness for the Where I Can Be Me® social skills program.